This old wheelbarrow was one of my very first junk garden accessories, and it remains my favorite. I seal it with Thompson's Water Seal almost every year to preserve it's chippy, weathered goodness as long as I can. I was lucky enough to find the old wringer on clearance last year for $8. It's perfect in my laundry tub. The larger tub is planted with pink, purple, and red calibrachoa, and white blush verbena. The smaller tub is bursting with an underused annual called the nicotiana. I love it's star shaped blossoms. One of my very talented friends from a local occasional shop, The Tattered Angel, made the shutter angel from a Pinterest inspiration. My flowers need an angel this season with all the rain and little sunshine! The crate at her feet is planted with single and double impatiens and two coleus. The angel is standing in a flower bed along the deck side of my house. Stonecrop sedum, now in bloom, are to her left. My first junk garden project for 2014 was the terracotta pot holder. Unfortunately, my red seed geraniums have not filled out much yet this year. I also have red geraniums in the window boxes. More sedums and creeping thymes fill in at the left, and hostas to the right of the angel. I am hoping for some warm weather and sunshine in the next couple weeks before my 2014 Garden Tour! Love the chippy wood on the wheelbarrow and the galvanized buckets of flowers in the wheelbarrow. What great garden art. Love the wheelbarrow, love the angel, love the flowers!! Everything is so pretty! Wish I had your green thumb. Carlene your gardens and all your organized clutter is just amazing, you have such a knack for pulling it all together. 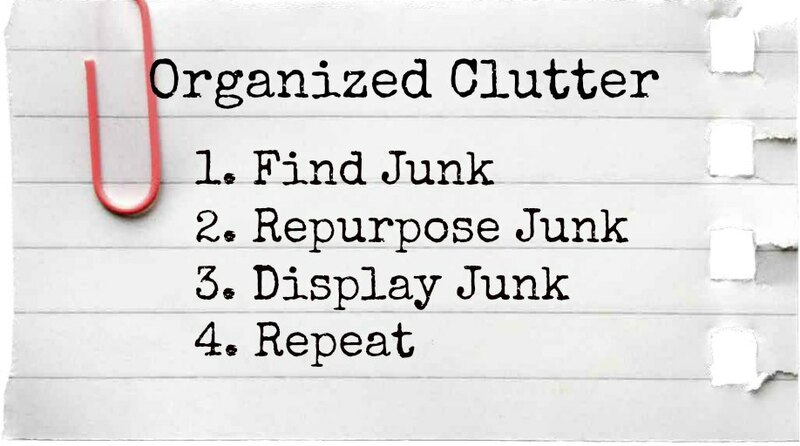 You give me ideas for all my wonderful clutter. Thanks so much for sharing your beautiful gardens.